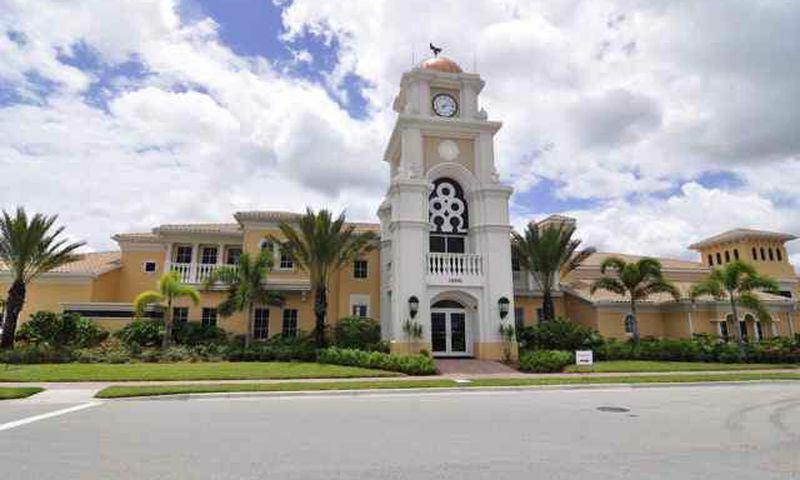 Village Walk, only 12 miles from the heart of Naples, is open to all ages yet designed to attract active adults. This beautifully landscaped, gated community features many amenities and staffs a full-time activities director. Village Walk's large clubhouse includes a fitness center, hair salon, travel agency, swimming pools, tennis and bocce ball courts, library, and card rooms. With 850 homes, Village Walk in Naples is an intimate community with many scheduled events and social clubs to help residents get to know their neighbors. Homes at Village Walk are available in both single-family models and attached villas. Nearly every home has a view of a lake or waterway. Those who enjoy the water will love living in this beautiful community with its close proximity to the sunny Gulf coast beaches of nearby Naples. Village Walk's amenities begin at the spacious clubhouse where residents can exercise in the fitness center, meet up for a game of cards, relax in the library, or share a meal at the community restaurant, L'Osteria Cafe. Village Walk provides residents with two resort-style pools as well as a lap pool. The outdoor amenities continue with six Har-Tru tennis courts and two bocce ball courts. In addition, the Village Walk community conveniently includes its own post office, hair salon, and travel agency. Many scenic lakes and ponds are dotted throughout the community, and interconnected walking trails and pedestrian bridges wind throughout the community to join at the central clubhouse. The beautiful homes at Village Walk are perfect for low-maintenance living. Lawn care, landscaping and exterior maintenance are included for all homeowners. These lovely resale homes were built by DiVosta between 1995 and 1999, and nearly every home has a view of a lake or waterway. Village Walk features both single-family models and attached villas. Residents who prefer an attached villa have a choice between two thoughtfully designed models such as the Regent or Capri villa floor plans, which range from 1,522 to 1,800 square feet. The attached villas feature two to three bedrooms, two bathrooms, and an attached two-car garage. The spacious single-family homes range in size from 1,544 square feet to 3,208 square feet and are available in four models: Windsor, Oakmont, Glenwood, and Manor. The single-family homes feature two to four bedrooms, two to three-and-a-half bathrooms, and two to three-car garages. Residents can stay in shape at the fitness center, play an invigorating round of tennis, or swim in one of the community pools. A full-time activities director is on hand to help residents plan their recreational activities. Daily conveniences are close at hand, as Village Walk has its own on-site travel agency, hair salon, and post office. In addition to its many amenities, Village Walk of Naples has several social clubs that meet regularly. Residents are sure to find an appealing social club from among the wide spectrum of offerings. Social clubs encompass such organizations as a book club, science club, walking group, and yoga group. Clubs meet to share many other interests as well, including bridge, poker, Mah Jongg, billiards, knitting, needle point, and more. Village Walk is located on Vanderbilt Road, within easy access of I-70. The community is only 12 miles from the heart of Naples, a popular Florida destination that boasts sunny beaches, world class shopping, fine dining, and challenging golf courses. Those who love water recreations such as boating, fishing, swimming, or even lounging on a beautiful beach will find plenty to do along the calm waters of Naples Gulf coast. Homeowners will never have a dull moment living in Village Walk. There are plenty of activities available in Village Walk. Here is a sample of some of the clubs, activities and classes offered here. The attached villas range in size from 1,522 square feet to 1,800 square feet. These villas feature two to three bedrooms, two bathrooms, and an attached two-car garage. Please note: Not all floor plans are available at this time. The single-family homes range in size from 1,544 square feet to 3,208 square feet. These homes feature spacious floor plans that include two to four bedrooms, two to three-and-a-half bathrooms, and two to three-car garages. Some models feature a den. Please note: Not all floor plans are available at this time. Village Walk was an easy choice for us as a home to retire. It's got everything going for it. The perfect location in Naples. Tons of high-end amenities (clubhouse, pools, fitness center, tennis courts, trails) plus nice conveniences like a hair salon, deli and post office. Everything is so close to home it makes life much easier on a daily basis. It's also gated which we liked for a bit more privacy plus it's not just a 55 and older community. Anyone can live here and we thought that was appealing for resale value and also so we don't feel like we're living with only an older crowd. 55places.com is not affiliated with the developer(s) or homeowners association of Village Walk. The information you submit is distributed to a 55places.com Partner Agent, who is a licensed real estate agent. The information regarding Village Walk has not been verified or approved by the developer or homeowners association. Please verify all information prior to purchasing. 55places.com is not responsible for any errors regarding the information displayed on this website.